Find the GRTMA Station on Bike Everywhere Day! Greetings bikers (and could be cyclists)! Riders pick up goodies and treats on 2017’s Bike Everywhere Day. May is Bike Everywhere Month, put on by Cascade Bicycle Club and celebrated by our partners all over the state! All month long there are activities celebrating cycling, with a special focus on Bike Everywhere Day. Bike Everywhere Day is Friday, May 18th. You can find GRTMA on the trail with a very special support station from 6-9 am on Bike Everywhere Day. This whole month is a great opportunity to get ready for our favorite time of the year, Tour de Redmond! We might be biased, but Bike Everywhere Day is a blast. Thousands of cyclists pack the streets. Smiles, waves and the friendly ring of bike bells fill the air. No matter what or where your commute, you won’t be riding alone on Bike Everywhere Day. If you are feeling skeptical about Bike Everywhere Month, this Friday, May 18th’s Bike Everywhere Day is an ideal day to ride for the first time, because no matter where you’re riding from, we’ll be out there with you! 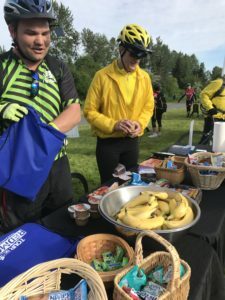 Commuter stations (read free goodies and snacks) and experienced riders along major routes will ensure that encouragement, support, and fun are never in short supply. 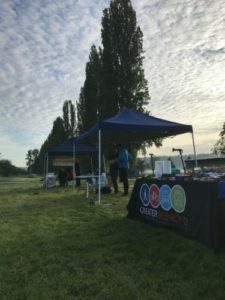 On Friday, May 18, 6 – 9:00 a.m. We will be on the Sammamish River Tail between NE 124 Street and NE 116 Street (Near Sixty Acres Park concession stand/restrooms). 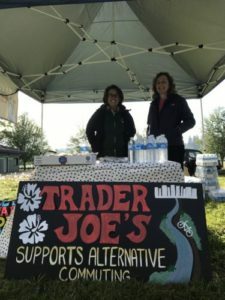 This year’s sponsors are Performance Bike, Trader Joe’s, Costco, Redmond Center, QFC and Bella Bottega. We will have bike goodies, snacks, prizes (find us for a chance to win gift cards to our sponsors!) and more- this year we’ll have some of our best Tour de Redmond swag yet! We can’t wait to see you out on the trail for Bike Everywhere Month. Make sure to grab your buddies and find us Friday, May 18th on the Sammamish River Trail. Our partners Go Redmond will be hosting their Bike Bash party after work (complete with food, drinks, bike clinics, our team and more!) so Bike Everywhere Day is sure to be just the kick-off you need to a summer of happy commuting!